Last week I visited Microsoft for the Microsoft Business Intelligence Seminar presentation given by Rafal Lukawiecki (Twitter|Blog). I must say that I found this one of the most valuable full day presentations that I have watched in a VERY long time for many different reasons. It is probably fair to say that I have probably not engaged BI as much as I probably should have over the last few years, since I have been focused on many other things. However it was plain to see that much of Rafal’s vision for the future of BI in IT was a very real possibility and as such is a compelling reason for me to re-engage. Certainly since the introduction of SQL 2000 Analysis Services, I am impressed by the pace in which the technology has matured. 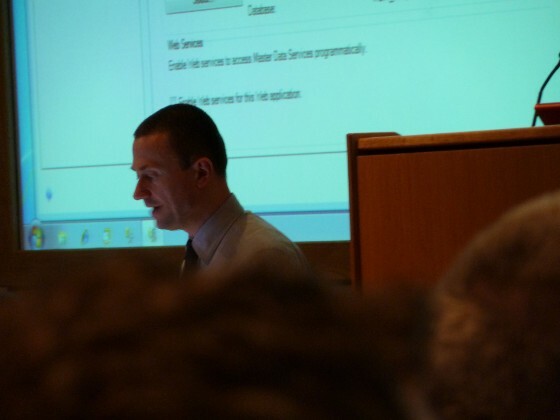 I recently mentioned having visited this session to SQL Developer and Powershell guru James Boother (Twitter|Blog) who expressed his regret as missing this fantastic event and I promised to publish my notes for the day on my blog. Therefore after putting my notes through my own process of data-cleansing, hoping you may find them of use in some way. Please remember that for some of the notes it may not always be explicitly obvious as to their intent, but hopefully most of them will be and I’ve taken a little effort to make them so. Secondly some of the notes from what I understand may not be public domain so please bear that in mind, because things discussed may change in the future. Finally remember that the notes may contain inaccuracies due to several factors. Firstly I am not perfect (shock horror!) and secondly it is very difficult to capture expended accurate notes during a flowing presentation -since I don’t do shorthand. Please click here to access the presentation notes or access through the Enlightenment menu. This entry was posted in Events, Personal Development, SQLServerPedia Syndication and tagged Business Intelligence, Public Speaking. Bookmark the permalink.